Conservation is important for so many reasons — economic value, ethics, intrinsic value, ecological balance, and a host of other reasons. Personally, my drive to conserve threatened and endangered species comes from an intrinsic appreciation for animals as well as a deep understanding of their ecological importance. I recently began volunteering with Island Conservation so that I could help by giving what I had to offer – my time and my commitment to their efforts to save species from extinction. Island Conservation’s work inspires me because they are taking action to save some of the world’s most beautiful and threatened animals on this planet – and they are successful at it. I am particularly fascinated by the evolutionary processes that have led to the diversity of species, which are often endemic to their island habitats. Every island is distinctive and beautiful, with unique species diversity where every individual plays a critical role in maintaining the ecological balance. This rings true on islands such as Floreana in the Galápagos Archipelago. The Floreana Giant Tortoise was thought to be extinct since 1850, but was rediscovered in recent decades through genetic analysis of wild tortoises historically translocated by whalers to Isabela Island, Galápagos. This species is vital to the Floreana ecosystem where it grazes the native vegetation and disperses seeds and the absence of the tortoise is having drastic effects on the island’s vegetation and overall biodiversity. Invasive species on Floreana currently prevents the possibility of tortoises breeding there. Island Conservation is working with Floreana residents and partners to restore the island by removing invasive species. Although it’s small, the Anacapa Deer Mouse, a subspecies of Island Deer Mouse is important in its ecosystem. As the only endemic mammal on Anacapa Island, California, it has significant effects on the island ecosystem, where it helps to maintain the diversity of plants through seed dispersal. Island Conservation and it’s partners helped protect the Anacapa Deer Mouse population by removing invasive rats from the island in 2002-2003. The results were dramatic. Island species evolved to provide ecological services, from distributing seeds, to pollinating the native flora, to maintaining the balance of predators and prey. Every island has its own unique balance of species that work together in a functional ecosystem. These ecological systems have been millions of years in the making, but can be harmed rapidly by the introduction of invasive species. The evolutionary processes that have created these ecosystems have also lead to remarkable species adaptations; many island species have developed striking colorations, which only adds to their beauty and intrigue. The Reischek’s Parakeet, listed as Near Threatened by the International Union for the Conservation of Nature, is a vibrant green bird that is often speckled with red and blue on its wings and head. This species is endemic to the Antipodes Islands, New Zealand; conservation here is necessary due to invasive rodents that invaded the limited geographical range that this and other rare species inhabit. 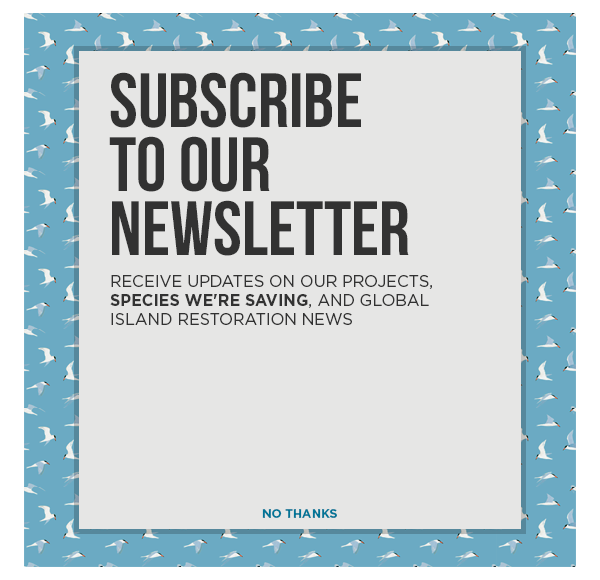 In 2016, Island Conservation joined the Million Dollar Mouse project, an effort to restore Antipodes Island through invasive rodent removal. If you ever find yourself off the coast of Alaska, you might notice a particularly eye-catching bird with a bright orange beak and feet, which contrast the mostly white and black body. This is the Tufted Puffin. In 2013, the Tufted Puffin was discovered breeding on Hawadax Island for the first time ever following the removal of invasive rats. Tufted Puffin. Credit: Marc Romano/USFWS. These are only a few of the many island species that have been helped or are set to be helped by conservation efforts. Recent studies have revealed the true value of removing invasive species from islands where they upset the ecosystem balances and put native species at risk of extinction. Removal of invasive species allows islands to return to their natural processes and gives native wildlife and vegetation a fighting chance to recover from the brink of extinction. Island species around the world are at risk of extinction, but they also have the advantage of geographical limits. Because islands are finite, conservationists can remove every single individual of an invasive population and thereby enable the ecosystem to fully recover. This is why I give to Island Conservation: I believe the work we are doing to conserve endangered species is critical in a world where the value of species often goes unnoticed. The recovery of these species gives me hope that we can prevent future extinctions by focusing our efforts on the places that are most at risk. I’m curious to know–what about you? What inspires you to conserve nature and protect wildlife?